Review: Jessica, Alexia, Peter, Luke, Danielle, Anna, and Jeffrey- what do they all have in common? Mr. Terupt. Because of Mr. Terupt is an amazing novel that made me feel the pain, sorrow, and joy of all of the characters. Seven different characters tell the tales in this well- crafted story. Although this is only the first novel by Rob Buyea, he shows that he can tell a story. All of the different characters, Alexia, Jessica, Peter, Luke, Anna, Danielle, and Jeffery, all have a different take on what happens. You get to see the perspectives that different the people have on situations that present themselves. I put this in a category with school stories, stories that take place in any kind of classroom. In this, case a classroom where magic happens. This book starts in September on the first day of school. Each character has a different reaction. Peter: "It's bad luck that we have to have teachers in this world, but since we're stuck with them, the best we can hope for is we get brand-new ones." Jessica: "The first day of school. I was nervous. Somewhat." Luke: "I like school. I'm good at it." Alexia: "I was like; I have a new guy for a teacher. That's so cool." Jeffrey: "The kids in my class are alright." Danielle: "School wasn't so great." Anna "I didn't say much in school and I never raised my hand." All the kids think that this year is going to be normal. They could not have been more wrong. A hospitalized teacher changes the grand scheme of the story. This teacher teaches the kids lessons that they had no clue about, by not saying a word. The presence of this man teaches the kids to stand u for themselves and have a new outlook on the world. Each character evolves throughout the story to create a cast that is truly special. .I raved about this book to all of my family, and I do not think I have ever liked a book this much. I really enjoy how Rob Buyea tells the story through each of the character's eyes. I think it is cool how all of the characters connect to each other and share a common thought, Mr. Terupt. The bond between the kids grows stronger and stronger as the story progresses. Only on person could have such an influence, and that is Mr. Terupt. The author keeps the story moving even though he switches characters viewpoints. I was on my toes wondering about the fates of the characters all night. I had trouble putting it the book down to eat much less sleep, much less eat! I have a real connection to this book. The sorrow that the characters felt for their teacher reminded me of how I felt when my grandma was in the hospital. When the characters were sad, I felt sad, when the characters felt joyful, I felt joyful. The emotions that I felt while reading this story were very deep inside. Anyone who has felt love for someone in need will connect instantaneously with Because of Mr. Terupt. Just like Mr. Terupt I love happy endings. This book is no exception to the love of Mr. Terupt. The ending makes you want to know about the rest of the kids' schooling. I am hoping there is a sequel and if not I might write one myself. I love this book more than possible to put into words. I wish you could rate a book with six stars. We would like to thank Random House for providing a copy of Because of Mr. Terupt for this review. 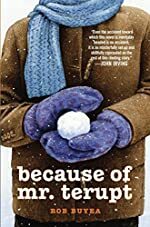 Have you read Because of Mr. Terupt? How would you rate it? Good job! I liked how you listed all the characters' point of views, and that you wrote about your emotions throughout the book. I'll get this book for sure!